I LOVE this new sentiment, H276 Our Family To Yours, and decided it was PERFECT for the carol I chose. I colored it with two different green and a red marker before stamping it onto some white cardstock. I added some fun sequins for a bit more sparkle and shine. After matting my sentiment with some dark red cardstock, I added the focal panel to a card base prepped with some fun patterned paper. 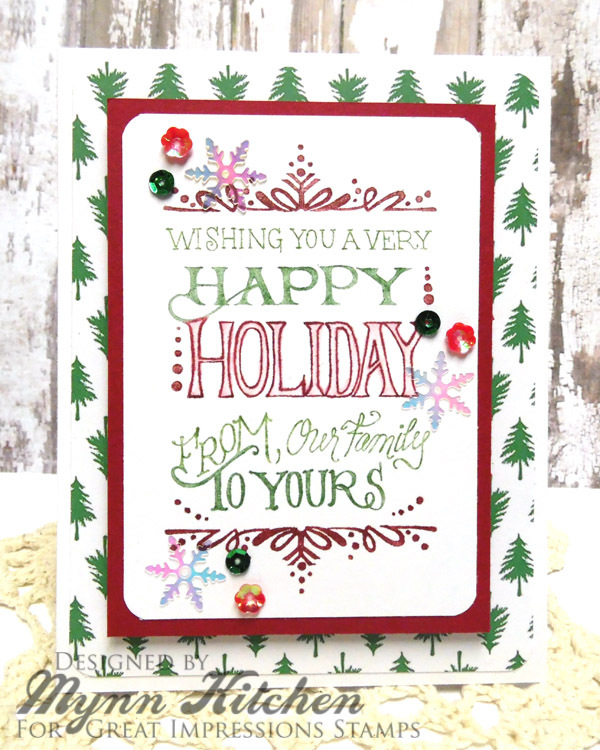 This card was SO quick and easy, I just know I could whip up about 20 of these in an afternoon! This is the PERFECT stamp for some last minute holiday crafting, so grab it from the Great Impressions store today! Thank you so much for stopping by today! If you'd like more chances to win, please check out the other posts from this week and stay tuned for another post tomorrow! See you then! 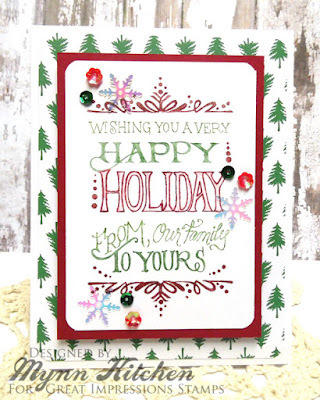 Pretty Card.....LOVE the large size of that beautiful Holiday Sentiment! What a sweet card!! That sentiment is perfect! I think this is for the song "We Wish You a Merry Christmas". 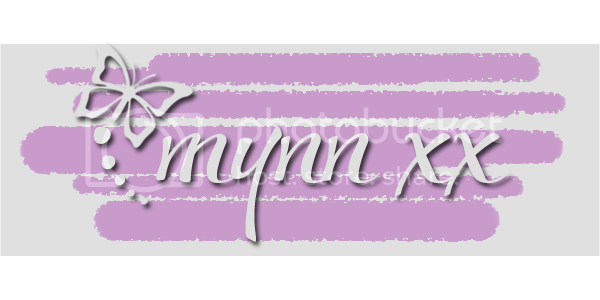 This is lovely, Mynn. My guess is "We Wish You a Merry Christmas". This is such a nice holiday card. I think it is"Happy Holidays to you". I'm guessing Happy Holidays. I think your card is simply elegant! Gorgeous card! I'm going to go with, "Happy Holidays"
Beautiful card - I'm going with We Wish You a Merry Christmas". Beautiful card, Mynn! I'm thinking maybe your inspiration was "We wish you a Merry Christmas." I too think the song is - We wish you a Merry Xmas and a Happy New Year. Cute card...I'm thinking..."Have Yourself A Merry Little Christmas" as the carol! What a fun card with the big sentiment! I am going to guess "We wish you a merry Christmas". Thank you for this fun holiday blog game!!! Beautiful card! This looks sort of tricky but I'm going with "Happy Holidays." Beautiful!! "We Wish You a Merry Christmas"
Another wonderful card design. And, the song is Happy Holidays! Love this big, beautiful sentiment! It really is the star of the card! I think the song is "We Wish You a Merry Christmas." Mabel & Vera ready for Christmas!!! November Challenge: Bling On The Holidays!